The night sky is beautiful tonight, the Moon is bright and the stars twinkling. Its busy overhead with more planes than usual for a Wednesday night. People trying to get home for the holiday. Cindy and I are heading out tomorrow morning and will spend the last part of the Holiday with my surprised Mother. 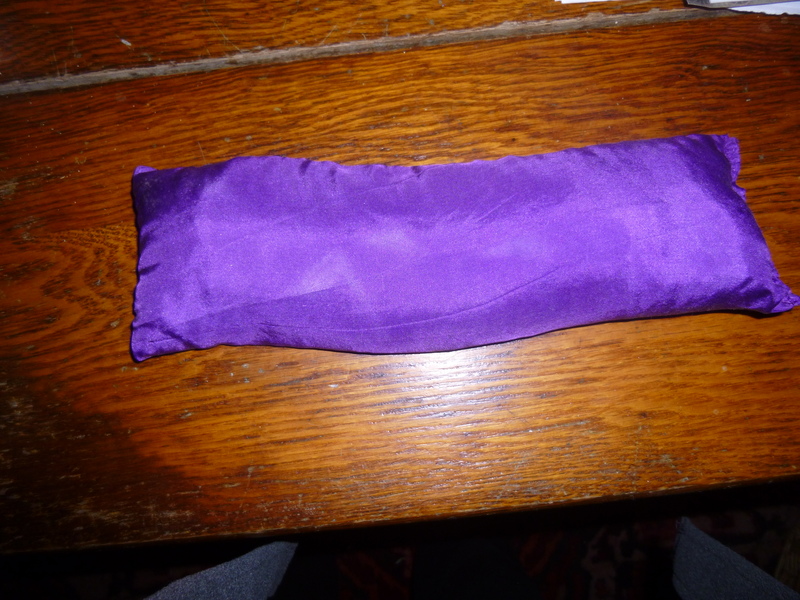 I made the silk eye pillow today. It came out good. I have a bag of dyed silk and will work on them when I come back. 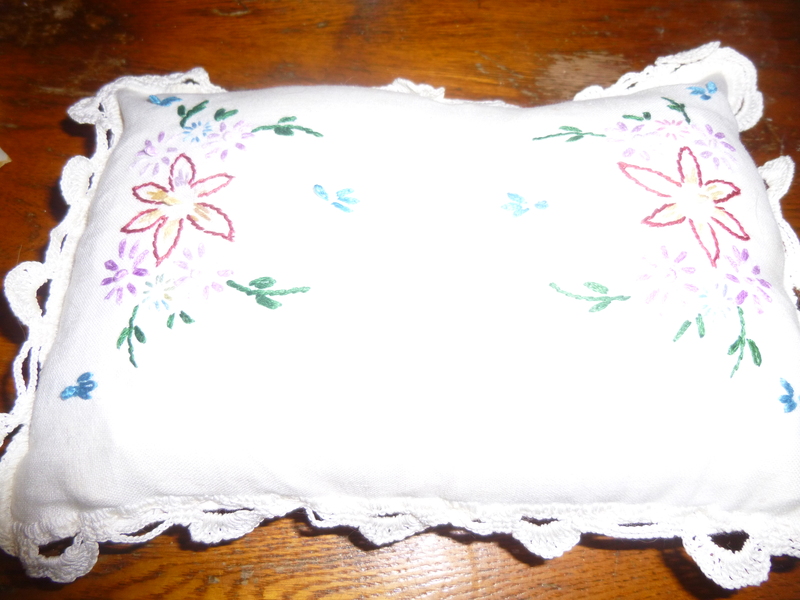 Today I made a small pillow out of some embroidery work that my Mother’s friend Carol had made. I was handed a shopping bag chock full of things like this at her funeral and I was overwhelmed. You see I have several boxes of doilies that my Grandmother in Maryland had made and am still trying to decide just how to use them. With Carol’s things I decided every time I got the sewing machine out I would make one thing. It’s not so overwhelming now. I have made 4 or 5 pillows so far of all sizes. This one is small but it will be good for my lower back when sitting and knitting. Today I had an idea about the doilies. They are all sizes and a off white color. I think I will make a quilt top. hand sewing them on a cotton sheet . It will use up a lot of them. I want to make useful things. I watch my old girl walk out of the barn and up the hill, she stops often now, her back legs have arthritis in them. Slowly she heads up the hill to her spot, soon the llama will join her. She will be 16 next month, quite old for a sheep. I look at her and think that she is quite wise. She eats when she needs to, drinks when she needs too, gets plenty of sleep and catnaps during day, has lots of exercise and enjoys the fresh air. I should follow her lead. It makes perfect sense. I want to wish all my America readers a wonderful Thanksgiving, full of family, and good food. 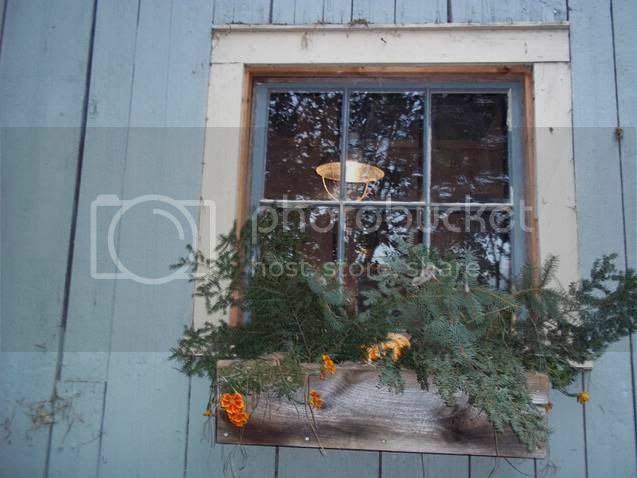 Thanks go to all of you who read my blog and I hope you have a wonderful day. What a treasure you’ve inherited! The pillow finish is just lovely! Have a safe trip tomorrow and a Happy Thanksgiving! The timer on the oven is calling me, Im on pound cake duty! Best wishes! The doily quilt top sounds great! Have a safe journey and how nice to surprise your Mom on Thanksgiving. Have a good one!